Rustin’s Michael Covert breaks into the Unionville secondary as Indians’ Gabe McLaughlin fights to break off a block. WESTTOWN — Two programs, two traditions — and maybe teams headed in opposite directions. When West Chester Rustin and Unionville get together on a football field, it pretty much always determines the ChesMont American Division title — won the last three years by Unionville — as the two schools have dominated the American for a decade. And while the Indians have been the dominant school in recent years, it appears the Knights are ready to reclaim their spot as top dog, while Unionville could be facing its first losing season in the Pat Clark era. Using a strong running game and powerful defense, Rustin shut down Unionville 14-0, Friday night. For Rustin (5-2, 3-0), the path is clear to winning its first ChesMont American title since 2014 — and is now poised to have a home opening round Section One, 5A playoff game. Unionville (3-5, 3-1), with powerhouse Downingtown East looming on the schedule may have to scramble just to make the Section One, 5A playoffs — the season-ending game against Sun Valley could well eliminate the loser from making the 16-team 5A field. 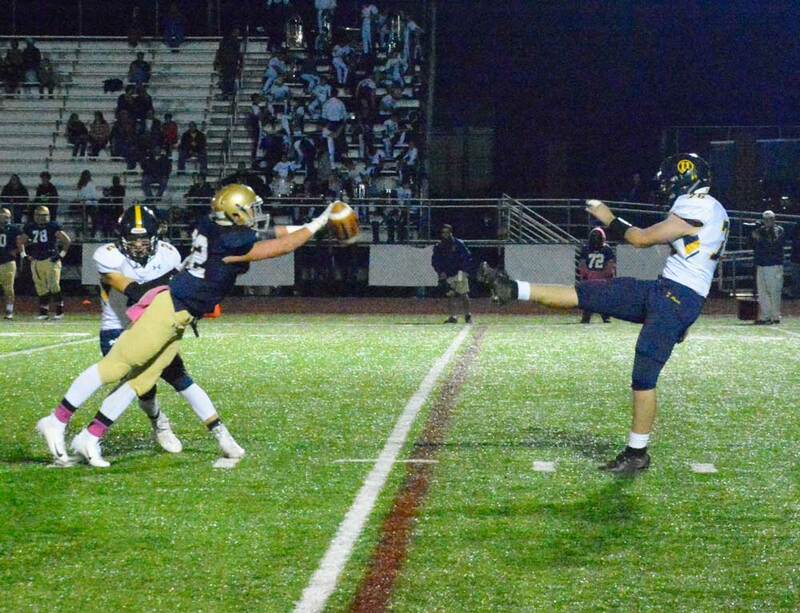 Rustin’s Luke Stout just misses a punt from Unionville’s Declan Boyle. A first half interception of Unionville QB Blake Charlton that set up a Rustin TD run. A Unionville drive that stalled on the Knights’ 15, followed by a missed field goal attempt. 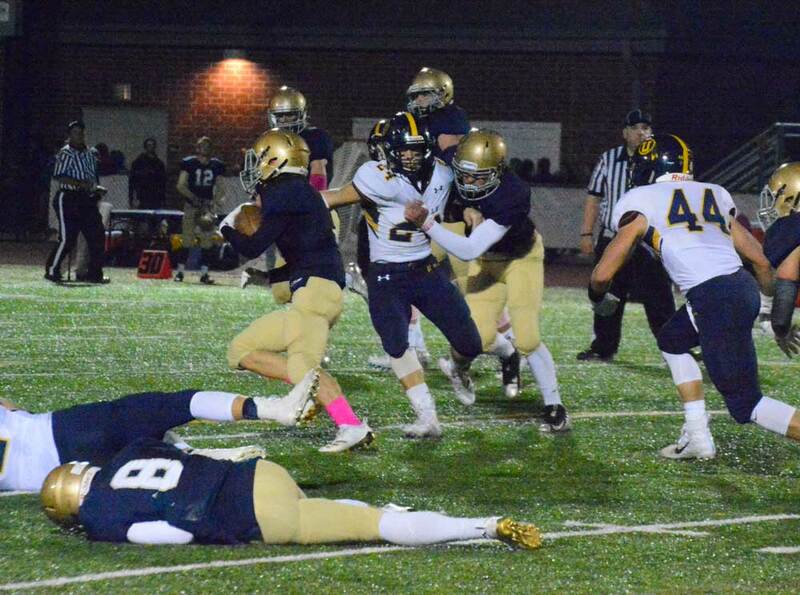 A failed fourth-and-1 play at the Rustin 20. An 85 yard run on a naked bootleg by Rustin QB Will Pileggi, moments after Unionville had pinned the Knights deep in their own end. With an offense stuck in neutral — the Indians have scored one TD in their last eight quarters — Unionville had little margin for error and, in the end, that handful of plays proved decisive. Nick Madonna scored Rustin’s first TD, in the second quarter, a 7-yard dash to the right to make the score 7-0 at the half. Pileggi’s run in the third quarter — after his long run gave the Knights the ball on the Unionville 1, made it 14-0. Rustin will need wins against Sun Valley (3-5, 0-3) and Great Valley (2-6, 1-3) to lock down the ChesMont American title, while Unionville faces a Downingtown East team handed its first loss of the season to crosstown rival Downingtown West Friday, before wrapping up the regular season against Sun Valley. While Rustin seems to have regained its form from earlier in the decade, Unionville is in uncharted territory for a program that marched to a Section One, 5A title and a 13-2 record just a season ago. Clark noted that some of the younger players came into the game with little or no experience in high-pressure games and it my have shown, Friday night. He also offered praise for his seniors — many of whom played key roles in last year’s championship run — and suggested they deserved a better send off then they are getting in 2018, but an opportunity for redemption is still there with two weeks left in the regular season.